Located in La Oliva (Corralejo), Barceló Corralejo Bay is close to Corralejo Dunes Natural Park and Corralejo Beach. 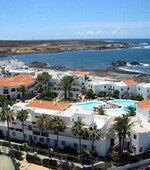 This modern beach hotel is also within the region of Papagayo Beach and Cotillo Beach. Guest have access to the full-service spa, where you can enjoy body treatments and facials. There is also a health club, an outdoor pool, and a sauna available. A restaurant is available to guests as well as a lounge bar, and poolside bar. Business services are available on site. The hotel has 231 air-conditioned guestrooms with private balconies and en suite bathrooms. 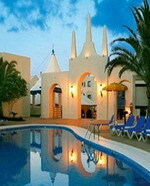 The Hotel is located in Corralejo, Fuerteventura, Spain. The beach is 100 metres away and the Dunes of Corralejo Natural Park is one kilometre away. 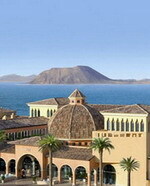 The Grand Hotel Atlantis Bahia Real is a modern hotel with arabesque-inspired architecture. There is an outdoor pool and a children's pool, both surrounded by subtropical gardens and furnished sun terraces. The health club contains a spa, sauna, an indoor pool with massage current, treatment areas, and a gym with personal trainers. La Alacena Real Restaurant has sea views and serves buffet dishes for breakfast (complimentary), lunch, and dinner. Yamatori Restaurant serves a la carte Japanese dishes, including sushi, in a modern setting with wooden floors and water features. Il Giardinetto offers Italian dishes, and La Cupula presents Spanish dishes from a Michelin-starred chef. Corralejo is the largest resort on the Canary Island of Fuerteventura. Popular with couples and families, this former fishing village is notable for its fine sandy beaches which stretch for miles along the coastline. Due to the strong winds that pass through the strait between Fuerteventura and neighbouring Lanzarote, the resort is also an important centre for windsurfers. Other sports which can be enjoyed in Corralejo include sailing, quad biking and diving. Because this low-rise resort is so flat, cycling is a popular way of getting around. There are several excellent beaches in and around Corralejo. To the south of the resort, between the Tres Islas and Punta de Tivas, are three beaches - Playa de Viejo, Playa del Medano and Playa del Pozo - which are also known collectively as Flag Beach. This windswept stretch of coastline is popular with kite-surfers and windsurfers, while Playa del Pozo is a favourite among naturists. Alongside Flag Beach are stunning sand dunes which now form part of an important nature reserve. Corralejo's main beach, Grandes Playas, stretches for over four miles and is notable for its soft, pale sand. 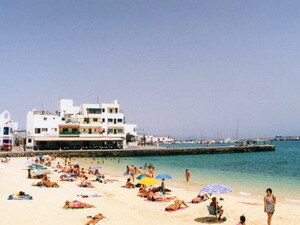 In the centre of the resort next to the harbour is the small, sheltered beach of Playa de Clavellina. With its gently sloping sand, this is a popular choice for young families. There are regular catamaran trips from the harbour to the island of Los Lobos, situated just a couple of miles off the coast. Los Lobos has an area of less than 2 square miles, so it is possible to walk around it in just a few hours. Fred Olsen operates a ferry service from Corralejo port to the island of Lanzarote across the strait. Big-game fishing trips are also available. The area around the harbour has a good selection of cafes, restaurants, bars and boutique shops. There are more shops along the Avenida Nuestra Senora del Carmen. Every Monday and Friday this street hosts the island market, which specialises in ceramics, lace, leatherwork and ethnic African goods. For entertainment the little plaza near the port, known locally as 'Music Square', is the place to go. Local bands and singers perform in the square every evening, and there are several music pubs in the surrounding streets. These include the Rock Island Bar and the Irish-influenced pubs, Rosie O'Grady's and The Dubliner. Baku Water Park is situated next to the market area to the north of the Atlantic Gardens. This family attraction has all the usual slides and chutes, plus a children's area for the little ones. If you are looking to pamper yourself while in Corralejo, why not try the 5-star Kempinski Hotel on the Avenida Grandes Playas. This has a top-class spa and beauty salon, plus three excellent restaurants offering Spanish, Japanese and Italian cuisine. About 10 miles (16km) south of the resort is the town of Oliva, notable for its gallery of contemporary Canarian art. An open-air museum looking at traditional island life is situated south of Oliva. Corralejo is around 45 minutes from the airport near Puerto del Rosario.